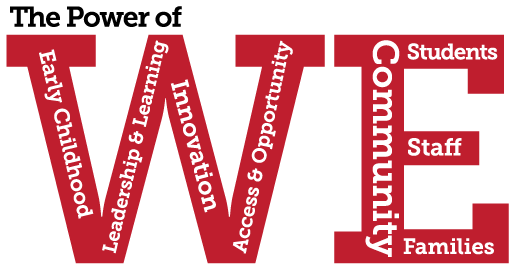 The “Power of We” is an intentional movement that values the strengths of the collaboration of all district stakeholders. The goal is to create a collaborative environment that will empower stakeholders to work together for the common good of our students and district. By investing in Pre-k programming, our students will be more prepared for success at the kindergarten level and beyond. By creating a culture of leadership, Colonial will strive to lead the way in cutting edge practices while continuing to listen & learn from parents, community and colleagues. Through collaboration, research and professional development, we will create innovative educational and professional experiences for our students and staff. By providing access to services such as health clinics and our summer feeding programs, opportunities arise for residents of our school district that will ultimately enhance the Colonial educational experience.